We welcome many guests during the months of October, November and early December. As we’re just outside Exeter city centre, people choose us for convenient city breaks, sightseeing opportunities, business retreats, relaxing stays in Devon and pre-Christmas shopping holidays. Will you also be joining us this autumn? As you’ll see with our guide to 10 things to do in Exeter this autumn, there are plenty of ways to fill your time whilst staying at The Devon Hotel. Organised by Exeter Cathedral, the long-running Christmas Markets sees many food and gift providers selling their products from iconic wooden huts in the heart of the city. Naughty but delicious foods, beer and drinks, items of clothing and entertainment come from local businesses and independent traders. At the same time, the bandstand will showcase local bands, carol singers and choirs to get everyone in the festive mood. Aside from the main Christmas Market, there are also several other events taking place. Magdalen Road is closed on 1st December for a one-day community event. Shops and restaurants take over the street who are also joined by stalls from all over the West Country. With over 50 stalls, there’s plenty of unique gifts to be found. There will also be delicious street-food and drink, live entertainment, fairground rides and much jolly-ness! Meanwhile, Castle Street Markets happen throughout November and December. This is run by the Council and is designed to give a trading opportunity to those unable to commit or afford to the main Exeter Christmas Market. Many items are handmade in homes or for independent shops, so it’s a perfect opportunity to pick up a Christmas gift with a difference. 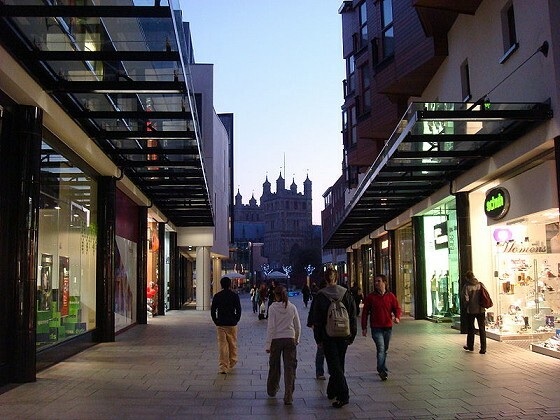 Exeter as a whole is the perfect place to quench the need for shopping, at any time of year. The long and historic high street is jam-packed with big names and independent shops. Branching off the street are big shopping centres, quaint streets and small hidden gems. So whether you wish to visit to do all your Christmas shopping in one day, or would like a casual browse around the shops, Exeter has you covered. With a selection of dining options and a wide selection of places to drink, you’ll be refuelled all day. Whilst wandering the streets and shops, keep an eye out for the history of the city. There are many historical houses and buildings, cobbled streets, old city walls and reminders of the cities past found everywhere. Keep an eye out for the “house that moved” in particular. Keep reading for more details on Exeter history. It’s hard not to constantly mention Exeter Cathedral, which is unavoidable considering it sits in the heart of the city, dominating the landscape. It really is the focal point of Exeter that needs to be seen to be truly appreciated. As well as being one of the finest examples of Gothic architecture found anywhere, the cathedral is a hub of activity and events throughout the year. Not all of these are religion based, so there’s plenty to do and learn for all. You’ll be missing out if you don’t take in both the outside and interior of the Anglican cathedral. 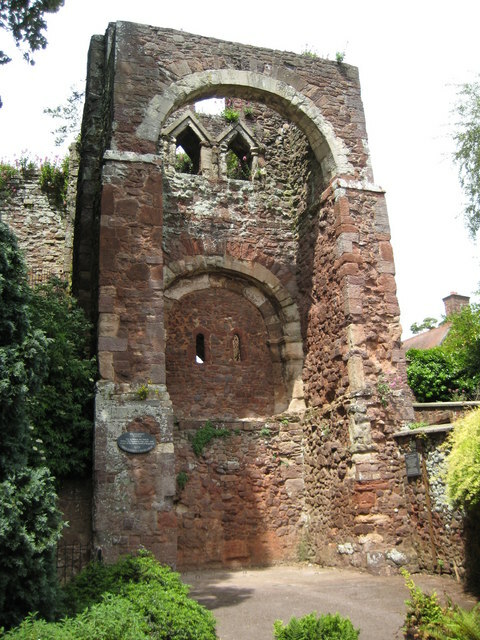 The Red Coat Guided Tours are an award-winning and free series of tours around Exeter, provided by Exeter City Council. 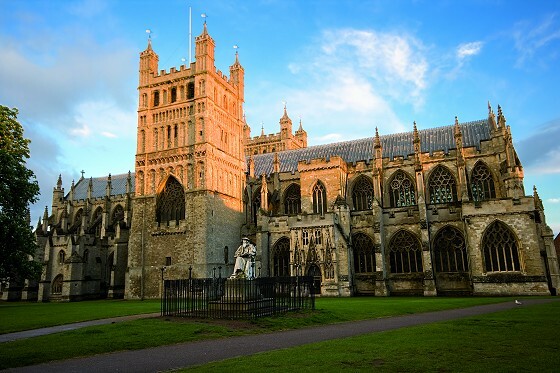 The tours are the perfect way to explore Exeter, experiencing all the history the city has to offer. They’re run by experienced and qualified volunteer guides, who host a variety of tours, each one focusing on a different aspect of Exeter's history and culture. Operating throughout the year, no bookings are required, simply turn up and meet a Red Coat Guide to spend 90 minutes discovering Exeter. Tours depart from the West Front of Exeter Cathedral. Tour types include; Canal Trip, Cathedral to Quay, Exeter Blitz, Exeter's City Wall, Ghosts and Legends, and Medieval Exeter - a small number of the variety of tours available. 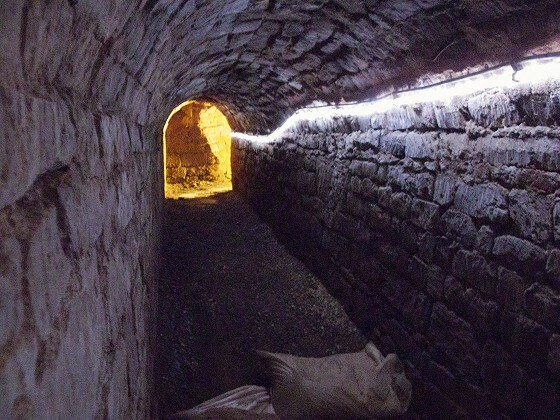 Exeter is a place that just keeps giving in regards to history, and deep beneath the main high street and the city centre are a series of tunnels originally built to contain water pipes that brought clean drinking water into medieval Exeter. These pipes regularly leaked, so there had to be enough room for workers to travel underground too. These days the pipes have gone, providing an opportunity for a guided tour of Exeter's Underground Passages. It’s a memorable event - narrow, dark, interesting and exciting, though perhaps not for the claustrophobic. Visit the heritage centre before your guided tour, packed with interactive exhibits and interpretation. The popular RAMM attraction is also found in the city centre, so those who love history and art can combine a visit with shopping and dining. The Royal Albert Memorial Museum & Art Gallery is full of colourful and classic exhibits and events. 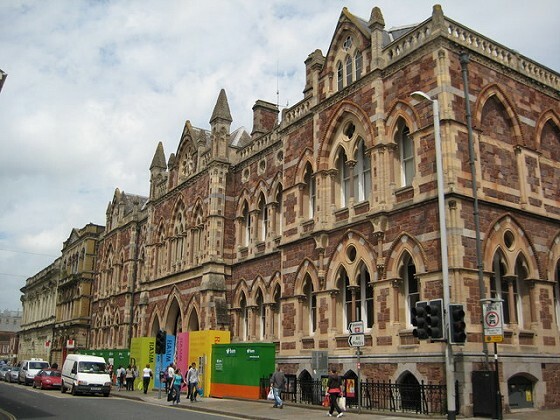 It combines elements of the National History Museum in London with the small heart and soul of Devon museums. Stunning displays and galleries are coupled with fabulous exhibitions and modern amenities. Exhibits range from animals to Pop Art to wartime Devon photography. The displays reveal the regions rich history alongside stunning items from around the world. RAMM is free to enter and comes with a cafe, a shop and free WIFI. With many things to do and get involved with, everyone can enjoy a day out here. The quayside is found where Exeter meets the River Exe. It’s an attractive and bustling place to walk, shop, dine, do a range of sports or feed the ducks and swans. Once a bustling port, now the quay is a popular place of leisure and relaxation. 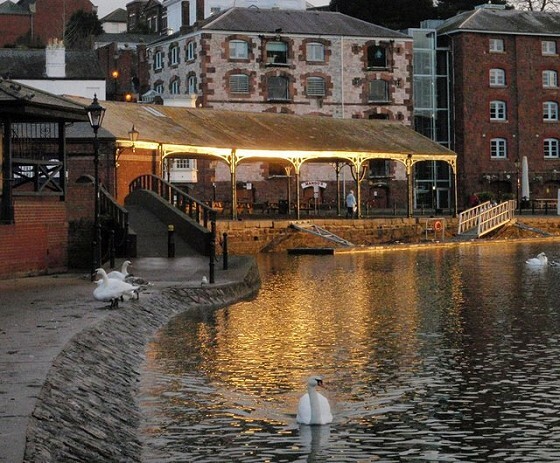 Fascinating history, interesting architecture, lively restaurants and activity centres are all found at Exeter Quay. Plus many annual events are held here, everything from charity runs to live music. You can choose to browse the antique shops at a leisurely pace, walk or cycle along the water's edge, enjoy a relaxing boat ride, hire a kayak or paddleboard, or find something good to eat. There’s also a ten-pin bowling centre, a climbing centre with the South West’s highest wall and quality places to hire out equipment for a splash on the water. Heading west out of Exeter is Dartmoor National Park - which in itself has many places to visit. 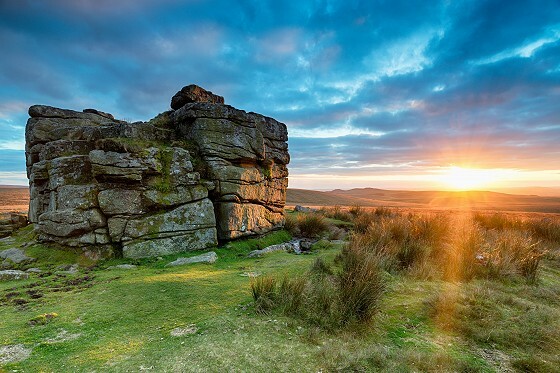 Dartmoor is a protected area of conservation filled with wild ponies, woods, valleys, rivers and rolling moors with formidable rock formations. If the rush of city life becomes too much, it’s just a short drive to the edge of the moors where the beautiful scenery and fresh country air awaits. From the front door of The Devon Hotel, it’s just a 20-30 minute drive to most of the key Dartmoor attractions on its eastern side. Many guests choose to combine a trip into Exeter with an afternoon on Dartmoor. We recommend visiting the moor for the beautiful views, the wildlife and the sheer amount of walks that are available - from gentle strolls over the remote land, to all day hikes through wild woods and friendly villages. Found just ten minutes from the hotel, Exeter Racecourse is in a stunning location with views of the beautiful Devon countryside. Everyone is guaranteed a great day out, whether you’re an experienced or first-time visitor to the races. Events take place throughout the year, with corporate-friendly weekday meetings, holiday fixtures to suit the whole family and a popular Ladies Evening in May. The racecourse offers a range of restaurant and bar facilities to complement the excitement of a day’s racing. From the rush of watching horses race to the thrill of betting money, visit Exeter Racecourse during your next visit to the area. After a busy day out seeing everything Exeter has to offer, it’s time to put your feet up and relax before heading to your luxury room. Work up a sweat in our gym, enjoy a hearty meal in The Carriages Brasserie, unwind in the hotel’s Lounge Bar - it’s time to recharge ready for the next day. We hope you can enjoy as many of these events and attractions as possible if you’re in Exeter this autumn. 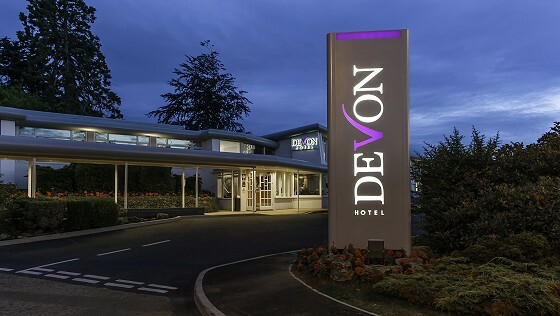 If you would like accommodation in a 3-star hotel with luxury dining options, please think of The Devon Hotel.